The story's main character wakes up from a coma in a hospital ward. He leaves the hospital and begins exploring the seemingly deserted city. Then he discovers that it has been overrun by zombies! While running for his life he meets other survivors along the way. Together they try to find a way to escape the terrible city and search for a place that the infection has not yet reached. 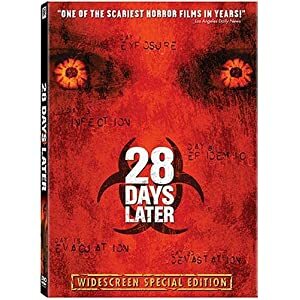 Full of wild zombie chases and unsettling scenes, 28 Days Later is a zombie masterpiece that scares and intrigues its audience. The story is very basic and there are no deep plots, just in-your face horror and suspense! The shots are really magnificent and well-done thanks to the visionary mind of its director, Danny Boyle. This movie is recommended for fans of zombie films and anyone looking for a good scare.